Thank you for making us rank 2 in the category Top Hotels Tigaki! Recommend us on trivago! Choose Kos for your holiday. Let Tigaki’s Star hotel provide you with everything you need to enjoy the peaceful and quiet atmosphere. The management and the staff welcome you to the totally renovated Tigaki’s Star Hotel, ready to satisfy all your desires. Tigaki’s Star is a comfortable family 3*** stars hotel with a capacity of 73 rooms. 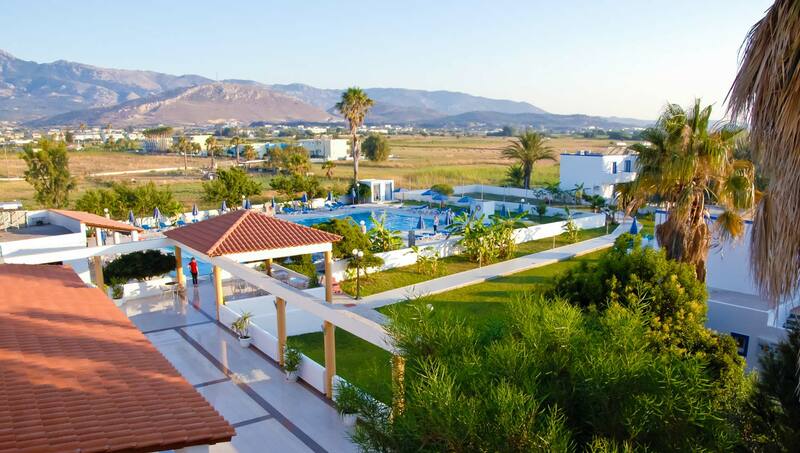 Situated 300m from Tigaki beach, a famous summer resort of Kos Island with beautiful sandy beach and near a beautiful natural habitat with floral and fauna. On the beach there are water sports and umbrellas with charge. Tigaki’s Star has an outdoor swimming pool 25m length and 2.70m depth. For its small guests there is a swimming pool and playground. On the pool there is a Pool bar, which is also a small tavern, where you can taste the delicious Greek dishes, drink a cocktail and of course you have the opportunity to watch sports or news by the Satellite T.V. At the main building there are the breakfast area and the living room, where you can have access to the Internet. All family works at hotel, welcoming our guests and trying to make their stay in Kos an unforgettable experience.